An 11.6-inch laptop with a Core i7 processor. 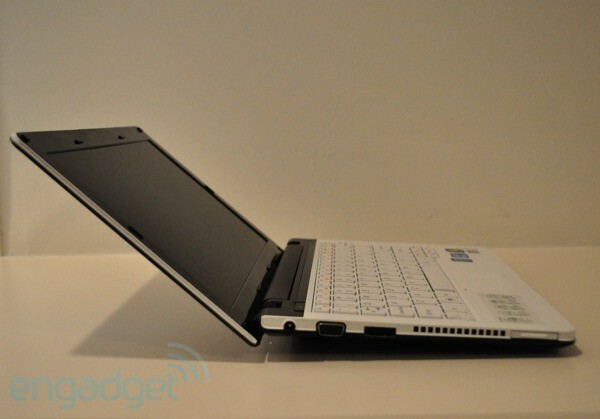 Does the Lenovo IdeaPad U160 really need more of an introduction than that? Believe it or not, the ultrathin laptop you're peering at above isn't much larger than a 10-inch netbook, but instead of packing underpowered parts (ahem, Atom) its got one of Intel's most powerful ultra-low voltage processors. For $1,149, the U160 is meant for highly mobile power users, but also those with a portable fan and a bag that can fit a few extra laptop batteries. We'll explain it all in our full review after the break. 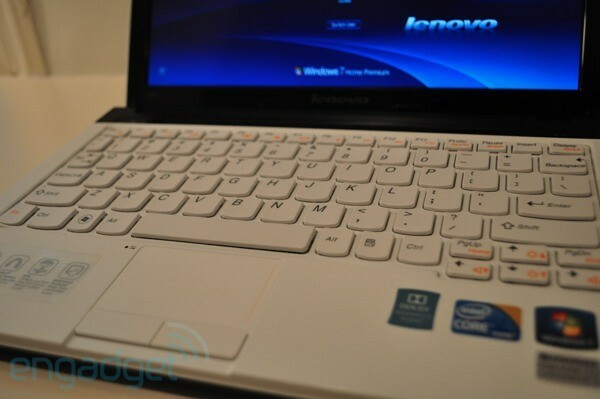 Be the first to review the IdeaPad U160? It's not hard to tell that the U160 is part of Lenovo's IdeaPad consumer lineup by the checkered pattern that sprawls across its non-glossy lid. The cover design isn't entirely off putting in black – in red, it's a bit more obvious – but we can't deny our personal preference for Lenovo's classic looking ThinkPad line. Our real attraction is to the U160's thin and light bod – it measures only .9 inches thick and weighs 3.2 pounds. It was perfect for popping into a shoulder bag for a weekend trip and pulling out on to write an article on a cramped train seat. In terms of build quality, the U160's plastic chassis feels quite a bit more solid than Acer's 11.6-inch Aspire One 721. However, we noticed on our unit that the keyboard deck was a bit loose – Lenovo tells us it may just be our early production unit. Port-wise, the U160 has two USB jacks, an USB / eSATA connector as well as sockets for HDMI, VGA, Ethernet, microphone and headphone sockets. It also has a four-in-one card reader. Not surprisingly, there's no optical drive onboard. Besides the fact that the panel looked like it wasn't placed in properly, we rather like the chiclet keyboard. Similar to the keyboard on the ThinkPad Edge, the squircle shaped matte keys have a curve that makes it feel as if they've molded to your fingertips. 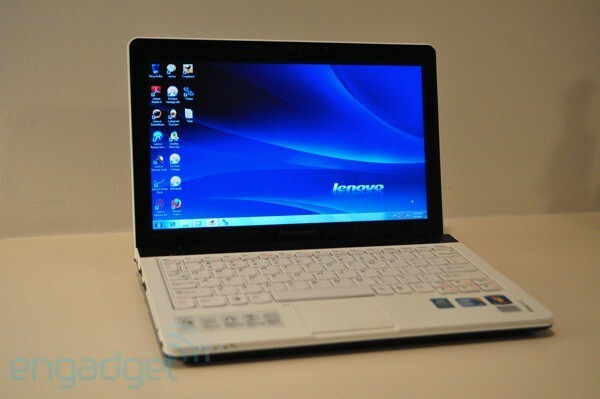 They are a bit cramped, however -- it would have been nice to see Lenovo use the entire width of the panel. 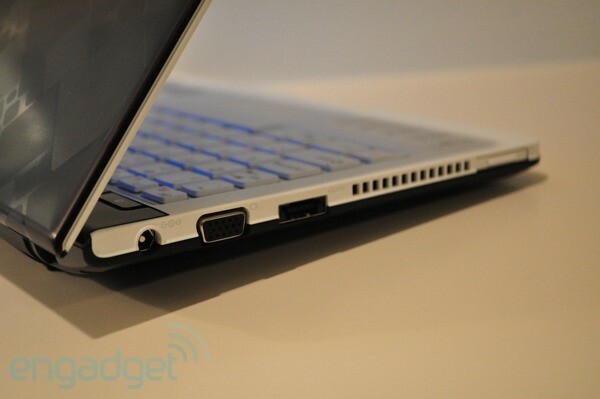 On the same vein, the touchpad is quite small. Measuring by 2.4 by 1.5 inches, it's a bit odd that Lenovo also didn't take advantage of more of the horizontal space on the palmrest and widen it a bit. The pad is still smooth, though the two mouse buttons are a slightly mushy. Still, it's much better than being stuck with a stiff single bar like that on the Eee PC 1018P. We're starting to think Lenovo has as big of an issue picking up decent LCDs as Acer and ASUS. Just like we saw on the IdeaPad S10-3t, the vertical viewing of the 11.6-inch, 1,366 x 768 resolution display was horrific at some angles. For instance, we tilted the screen back when watching a clip of Tosh.0 and we could barely make out any colors or see where his face started and ended. When looking at the screen head on, however, it was sufficiently bright, and the ambient light sensor adjusted the brightness to our liking. The speakers on the bottom were comparable to other laptops of its size – they're loud enough for listening to some tunes on Pandora, but not going to be the life of any party. The U160 is without a doubt the most powerful 11.6-inch laptop we've ever toyed with thanks to its 1.20GHz Intel Core i7-640UM processor and 4GB of RAM (the Alienware M11x comes close, but it was then powered by a Core 2 Duo processor). However, it's nowhere close to being the most powerful Core i7 laptop on the market, and as the benchmarks below show, the U160 falls in between a standard voltage Core i3 laptop and some of the newer AMD Nile-powered ultraportables on the performance scale. Every day use was still snappy and our typical routine – simultaneously running Firefox with over ten tabs open, Tweetdeck, Microsoft Word, Trillian, Skype and iTunes – was no challenge for the little guy. On the graphics side of things, the rig's Intel GMA HM55 HD was nimble enough to handle both 720p and 1080p video (local and streaming). It also managed to plow through World of Warcraft at a decent 27fps. However, as the 3DMark06 score below shows, the integrated GPU isn't quite as fast as AMD's integrated ATI Radeon HD 4225, which has been coming standard on other 11.6-inch laptops like the Acer Aspire One 721 and HP Pavilion dm1. The U160 is certainly marketed as a multimedia machine and it can handle HD content, but it's not exactly the coolest machine on the market for those sorts of activities. And yes, we mean that literally. The entire chassis of the laptop – including its keyboard and touchpad – felt like it had been baking in the sun when streaming video. Even when we used the system to write this review and listen to some music, it got tepid and the bottom of the laptop got hot enough that we removed it from our lap to set it on the table. So, while the i7 processor may not be as powerful as a standard Core i3 CPU, it draws less power and must result in better battery life, right? Not quite. On our video rundown test, which loops the same standard definition video at 65 brightness, the 48Wh battery managed to keep the system afloat for only 3 hours and 10 minutes. A glance at the chart below shows that both the Core i3-powered Acer TimelineX and Toshiba Portege R705 lasted an hour longer than that. Yeah, it's pretty horrendous for a laptop of this size, and even the AMD-powered Aspire One 721 lasted an extra 20 minutes. We can't help but feel torn on Lenovo's decision to power the U160 with an ultra-low voltage Core i7 CPU. While it surely adds a lot of extra horsepower, we're left wondering who actually needs all of that in a smaller laptop, especially when other (cheaper) laptops on the market can handle HD content and basic games just as well, not to mention last longer on a charge and run much cooler. The U160 comes loaded up with some Lenovo utilities, but compared to some of the recent laptops we've reviewed from ASUS, the preloaded software isn't all that bad. 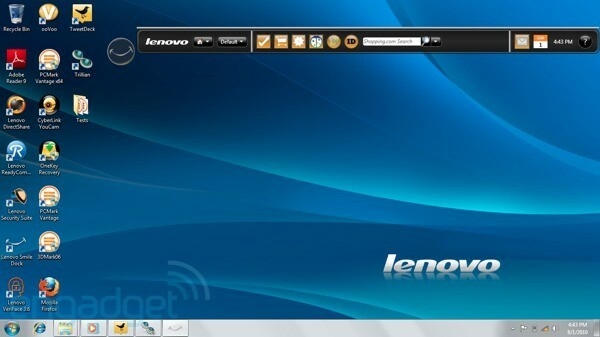 We do have to say that Lenovo's "Smile Dock" which can be launched by clicking on that little creepy smile icon on the desktop is one of the least helpful docks we've seen lately – it's full of shortcuts to Lenovo utilities, e-mail, Weatherbug, etc. At least you can search the web directly from the panel. After spending the last few days with the IdeaPad U160, we've come to the conclusion that the laptop is only for the few that demand more processing power than some of the other ultraportables on the market, yet are willing to put up with a few annoyances to have it. No matter how you look at it, these days $1,150 is a lot of money to shell out on a smaller machine, especially when other laptops out there that are just as light, run longer on a charge, and cost less -- just take the $799 13-inch Toshiba Portégé 705 or $450 Acer Aspire One 721. Yes, the U160 packs more CPU power, but at the end of the day you'll have to live with the heat and battery drain that it ultimately causes. And frankly, we wouldn't wish that upon anyone.